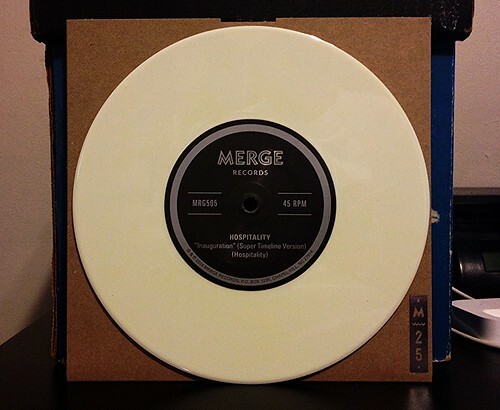 For the month of May, the Merge Records Or Thousands Of Prizes singles club dropped another new 7" on my doorstep. This time I was presented with 2 bands that I had heard of, but never really listened to much at all. This split would be the first chance I'd have to spend any real quality time with either. First up is Hospitality. While the female fronted vocals and wonderful backing harmonies create some very sweet melodies, this band sounds kind of old. Not necessarily in a good, cool throwback sort of way. They just sound dated, like they're trying to exist in a completely different time. There are a lot of genres ripe for a revival, though I'm not sure 70's easy listening is really the one to champion. Still, I find Hospitality significantly more interesting than Lambchop. Like Hospitality, they kind of reek of the 70's, but this band seems to be yearning for the days of the lounge piano player. The song starts simple, and builds, but it doesn't really build into anything all that interesting. It's kitschy in the way that songs like "MacArther Park" are, but that doesn't make it good.